5th September and I’m on my way to London Heathrow with Angela the UK Doctor and 13 participants for our Sumatra Jungle Challenge. Some of the group were already there over three hours before take-off… excited and ready for the challenge ahead. We arrive the morning of the 6th to Kuala Namu and were met there by Murad and Kinol our guides and transferred to the lush Jungle village of Bukit Lawang. On arrival we were greeted by a group of village boys who kindly carried our heavy bags to the lodge over a swing bridge. The lodge provided welcome drinks and rooms were allocated. The group were surprised how comfortable these were, despite only cold showers. A thunderstorm at 5pm took out the electricity for several hours. We were tired so an early night to bed before we embark on our Jungle adventure tomorrow. I woke to two cockroaches, a cockerel crowing, a large spider, incredible jungle sounds, two geckos and the call to prayer! The walk started over the bridge and through the village to the Orangutan feeding Platform. 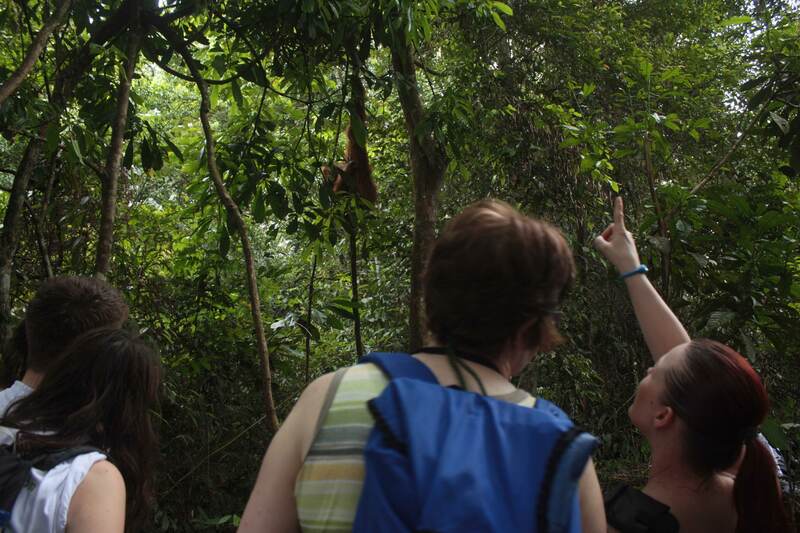 There are now well over 200 orangutans in this area. The macaques walked next to us on the paths and just above our heads which amazed everyone as they were much closer than everyone had expecting. The day was dry, warm and humid after heavy rain in the night. At the platform, we saw one mother and baby. Everyone loved it. The walk back through the Jungle was three hours and on route, we saw a male wild orang-utan which came close and onto the ground. 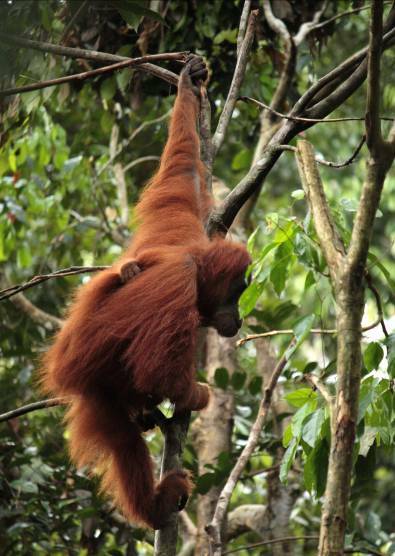 Later another baby orang-utan, previously rehabilitated was feeding high above us. We saw sunbear claw marks in the tree trunks and some very curious bugs. Everyone was in high spirits. On the route back, we passed the rubber trees being tapped and saw coco trees growing. 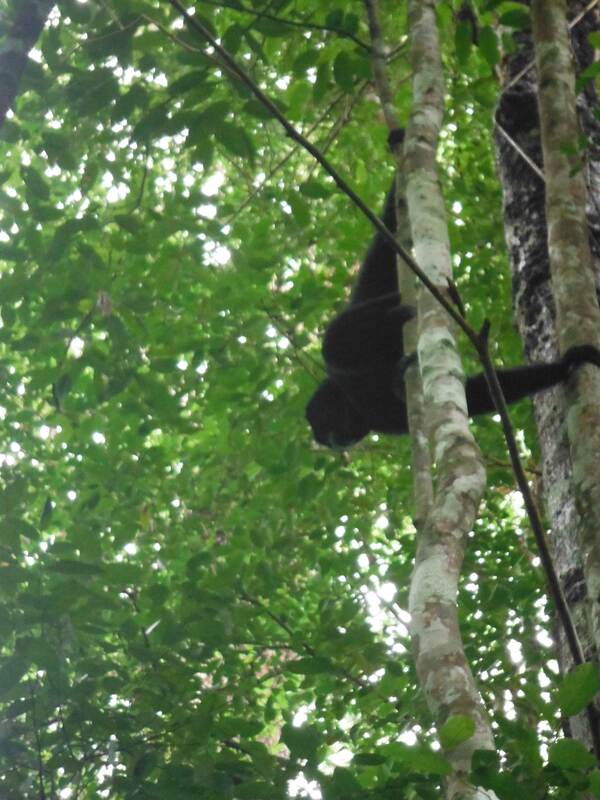 The Thomas Leaf monkeys came very near and were friendly. We headed off in the afternoon to the bat cave, a lovely walk on paths through a garden, past an orphanage to house children from the 2003 floods that devastated Bukit Lawang. A flash flood hit Bukit Lawang on 2 November 2003. Described by witnesses as a tidal wave, the water was approximately 20 metres high, as it came crashing down the hills, wiping out everything in its path. The disaster, which was the result of illegal logging, destroyed the local tourist resorts and had a devastating impact to the local tourism industry. Around 400 houses, 3 mosques, 8 bridges, 280 kiosks and food stalls, 35 inns and guest houses were destroyed by the flood, and 239 people (5 of them tourists) were killed and around 1,400 locals lost their homes .After eight months of rebuilding, Bukit Lawang was re-opened again in July 2004. 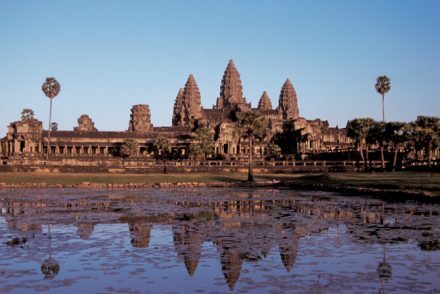 We head into the Jungle…. Departure day for the 5 day trek into Gunug Lesuer National Park. Following an early breakfast we did some warm up exercises in the lodge to the amusement of the staff. After group photos, with very high morale we set off. We saw hornbills, three lively orang-utans playing overhead and many insects. Lunch was wrapped in a greaseproof paper parcel and included rice, egg, salad and pineapple. Several slipped and slid during the day but nothing serious and no injuries to my relief. The rain started at 3pm and was torrential. 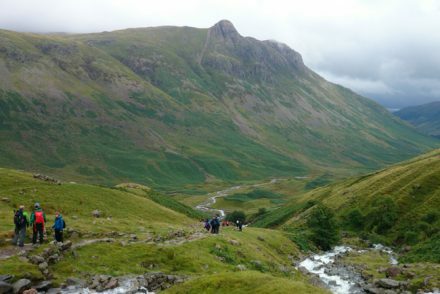 The final part of the walk was into camp by a river via a steep slope with roots and stones and a short wade through the stream water in already wet boots. Camp was set up and dry with a fire burning and hot tea ready. Evening entertainment with the guides and porters was fantastic and this was a highlight of the trip. After a briefing and dinner of Indonesian chips, curry, sambal tofu, chicken, peanuts and rice, we all sang and were challenged by the tricks and brain teasers before our first night of sleeping in the Sumatran Jungle. Morning after our first night in the jungle. At 0630, two porters were pointing into the trees – a curious orang-utan had come to check us out and woken the guides by dropping branches on the cook tent! As well as this a pig tailed macaque also appeared but not so far away. These are more like baboons and very aggressive. Club sandwiches filled with omelette, tomato and cheese and durian fruit filled us all up ready for the day. We left camp one at 9am and struggled up a very steep and muddy hill but spirits were high. There was a ridge at the top and a clearer path and through breaks in the trees we could see the jungle canopy below. A female orang-utan with a small baby clinging to her came close to us and we were able to watch her for some time. Just before lunch, we crossed paths with the other group who had seen a monitor lizard and crowned Cathy and Norman King/Queen of the Jungle. At the top of the next hill/mountain ridge, we heard gibbons calling which was not unusual here but when the gibbon appeared above our heads it was the rare black gibbon and the guides had only ever seen one before themselves! There are reportedly only 20 in the area. The adult with two youngsters entertained us by posing for the camera and coming close. She had a beautiful face like a teddy bear! When we had to continue, she followed us in the branches overhead. At lunch, the three gibbons continued to play in the nearby branches and watch us eating our noodles and egg. The route then headed downhill and the guides set up a rope for pax to descend. A short paddle through shallow waters to Camp Two by 4pm – no rain as yet today! Tea and a stunning plunge pool awaited. After washing in the pool, dinner including potato cakes and hot chocolate which we could eat outside, we had jungle stories and found frogs. Bats flew over us during the evening briefing and all headed for bed by 9pm when a thunderstorm and heavy rain started. 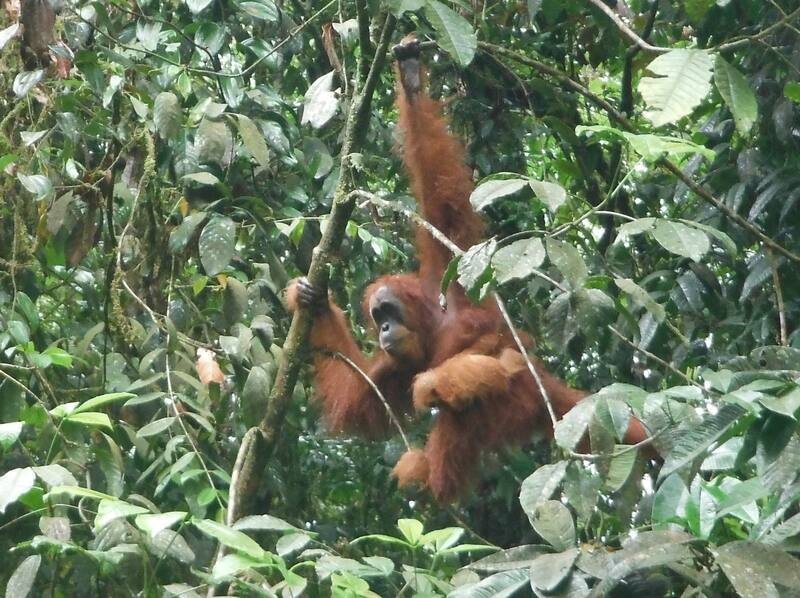 It had rained all night but it didn’t deter the orang-utan who came to visit us for breakfast! She appeared on the overhanging branches on the other side of the river to the camp. She had a teenager and a baby with her. After an hour she got less happy with our presence and moved fast to swing over the branches to our side of the river and very near to our sleeping tarp. The guides moved quickly to put themselves between us and the orang-utan but she was easily persuaded by some noises to move off. Pancakes with banana and lime were a popular breakfast. The rain eased off and we climbed another steep hill behind camp covered in a clay like mud, now saturated. After a 3 hour climb, we were rewarded with passion fruit and oranges. We briefly met the other group again who were on good form. Many people slipped on the next descent but remained in good humour. At the river, it suddenly started to rain very heavily at 1400 and the guides were quick to move the group upstream, conscious that the river levels would rise fast. The journey to camp then took 40 minutes. Initially this was a wade at shin height. We had to cross the river three times to remain in the shallowest water. We then all realised we hadn’t had lunch so “dunch” soon arrived and we watched the now raging river and logs floating down it. Stories and songs followed by candle light and more tricks and games which was great fun and by 9 another early night all were in bed and the rain had stopped. Aches and pains had set in today. Left camp to start another steep climb – stiff calves soon eased off and we reached the top in a couple of hours for a fruit break. We saw a hornbill and an eagle, fungus, a black squirrel, a skink and a sweet smelling blossom which apparently keeps away bad spirits. 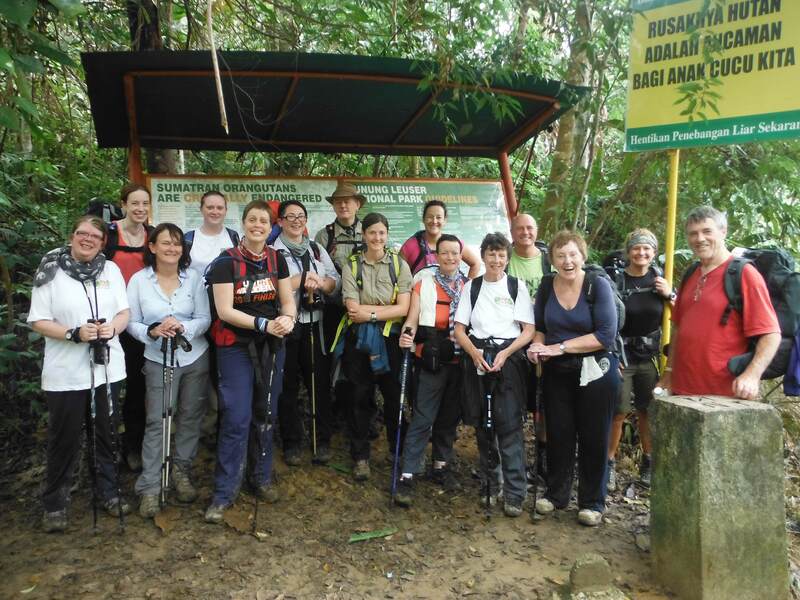 At the highest point we could see for miles eastwards over the primary rainforest and to Bukit Lawang. The descent was challenging again but the group have remained enthusiastic and positive throughout. The sun was out when we reached the stony beach and much reduced river for a final 20 minute wade up to Camp 4 and to meet the other group.. A large fire was lit and we all swam and washed in the river. The other group arrived 40 minutes later and Noodle soup for lunch was served on the beach and everyone relaxed and exchanged stories in the sun. Dinner included tree fern picked from the rainforest and served with chilli and garlic. As some wanted an early night and headed into their tarp, they were bitten by fire ants. There were hundreds and Kinol evacuated the tent. The guides used salt and insect repellent to finally get rid of them all after an hour. It did give an opportunity for Eddy’s stories and brown sugar and ginger tea. It was a dry morning so breakfast was back on the beach with pancakes and chocolate sprinkles. There was a great atmosphere and banter. 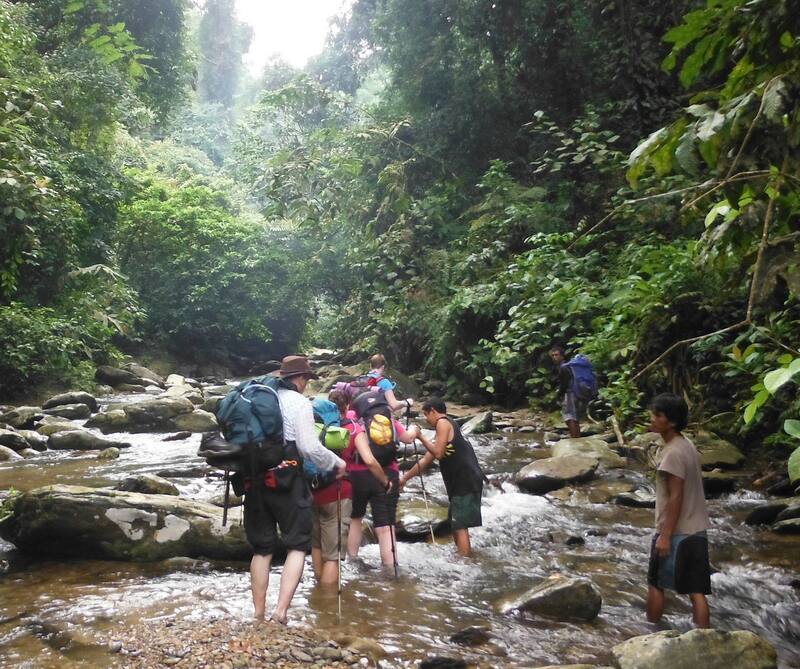 We waded upstream for our route out of camp and left the river and went across the rubber plantations. When we crossed the river for the last time, Murad was there to greet us. Away from the shelter of the jungle, the sun was very hot and it was much more humid. 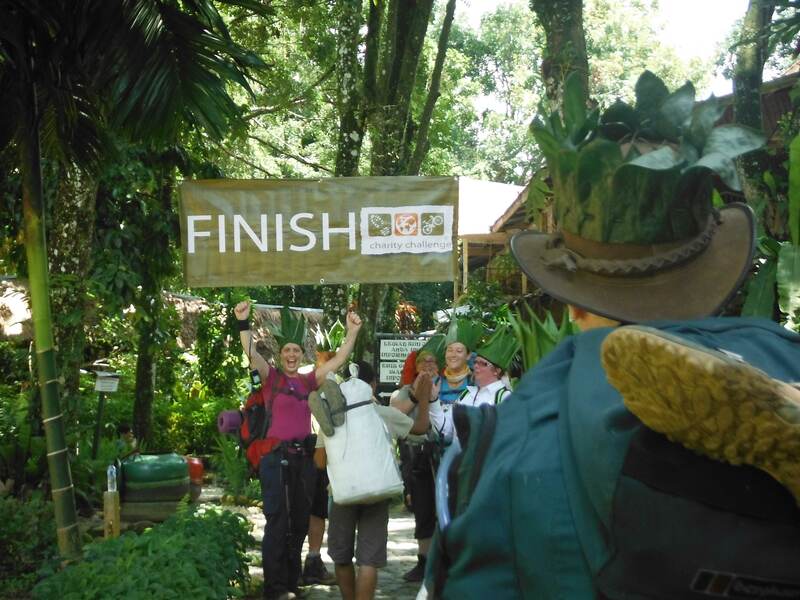 The finish banner was up at the lodge and we had photos and hugs. The comfort of a bed…..
We planted mahogany and mindy trees and some pax dedicated their trees to loved ones. The sun was hot and it was a lovely morning which all enjoyed. We were finished by lunch which we had in the lodge at the Tree replanting site, of wonderful local foods including pandan leaf sweets. The clouds were gathering so we went on only a short walk to see the Ship Cave The cave had once been inhabited and looks like a galleon but is very shallow – more of an overhang than a cave. Photos and goodbyes before we left to walk back via the orphanage – Kinder te Huis housing the children of those killed in the big flood. Everyone bought souvenirs, some made by the children. There was a warm welcome and drinks. All met at 6pm to go for the Celebratory Dinner at a restaurant just over the bridge. It had room for all the guides, porters and us. It was a good meal and was followed by speeches, awards and the singing accompanied by guitars. It was a fantastic evening and great end to the challenge. • Yes. It was a great to spend a couple of nights at the Ego Lodge before setting out into the jungle. Penny suggested that we pack our back packs exactly as we were intending for the challenge on the day we went to see the Orangutan’s and the Bat cave. This was an excellent opportunity to see how we managed with the weight we would be carrying. I ditched taking my sleeping bag ( just used my liner-which was fine) and got rid other none essentials. 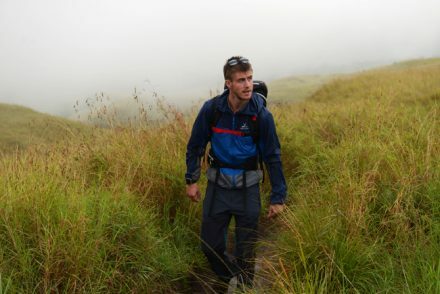 Carrying all your own gear was what made this challenge extreme rather than just tough. The trek itself exceeded all my expectations and although it was really hard the support from both your fellow like minded trekkers and guides made all the effort worthwhile. And when we reached camp each night the food was brilliant and the campsites were better than i imagined they would be like. And the evening entertainment from the guides was fantastic, full of fun and laughter to the point of crying. • Make sure you prepare yourself physically for the challenge both upper and lower body. Get used to carrying a large heavy rucksack when out trekking to get used to it. 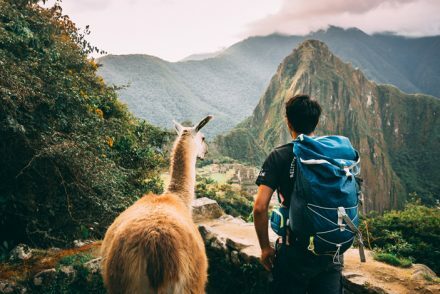 Really think about what is essential to go in your trekking sack and pack it a few times before you go. The smaller and lighter everything can be the better- particularly the weight and correct type of the rucksack itself, the sleeping bag ( one season only+/or liner),small compact mat that can go inside your bag. The rugsack probably needs to be minimum of 40 litres. River shoes essential- don’t think really needed the seal socks. Dry bags essential. 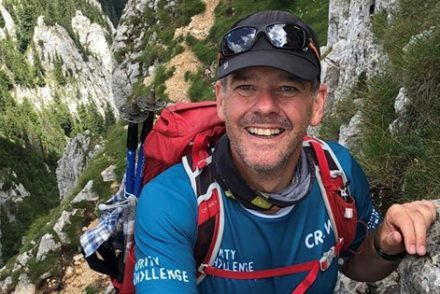 • Another incredible challenge which once again exceeded my expectations. The sights and sounds of the jungle will remain with me forever. But it’s the toughness of the challenge and testing your own ability to succeed that’s important to me. 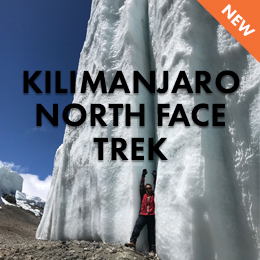 And this you achieve with like minded inspirational people who with the support of the guides and porters unite as one team to overcome obstacles along the way to achieving the challenge and making new lifelong friends. And knowing that when you get home you are already looking for your next challenge. 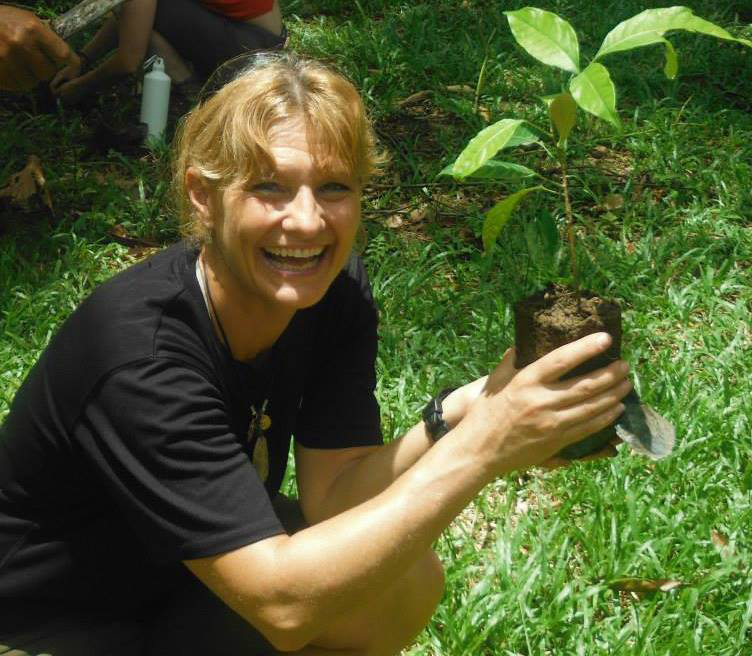 You can also find out more about our Sumatra Jungle Challenge by clicking here. 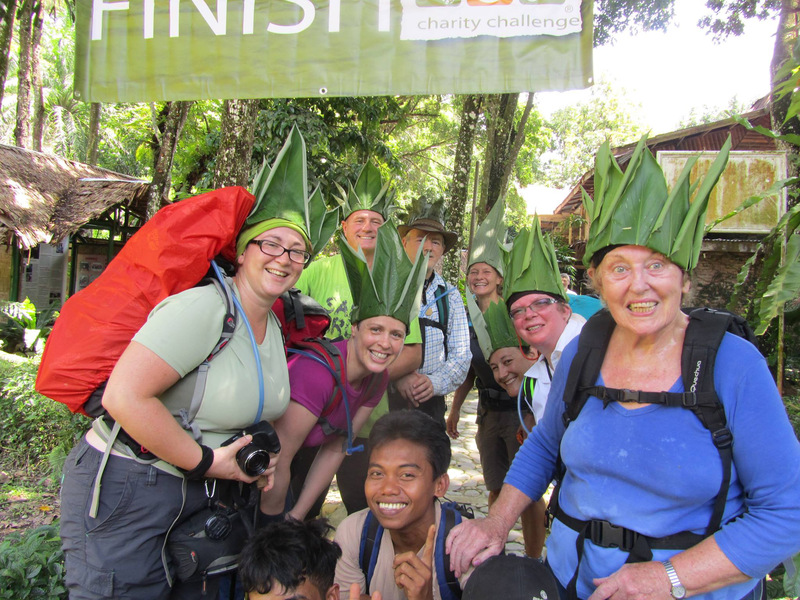 If you have any questions on this challenge, please contact us, our on challenges@charitychallenge.com. To see more information about the array of amazing challenges we have, please visit our website at www.charitychallenge.com. 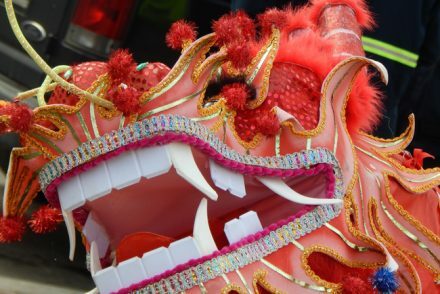 To keep up to date on all our challenge news, please subscribe to this blog. You can also enter your email address into the adjacent box to subscribe to our mailing list. 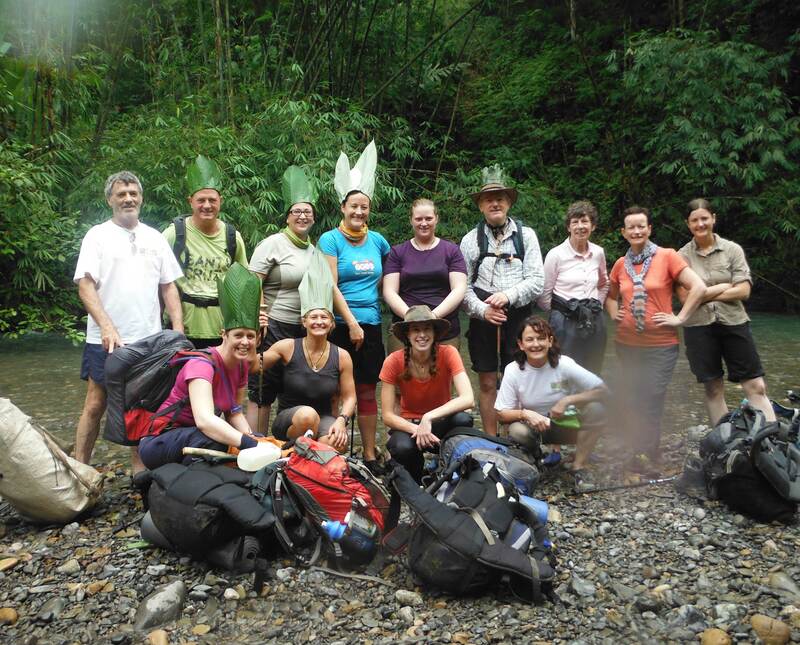 I did the Sumatra Jungle challenge at the end of September 2014 with Peak District Challenge Girls. Having breast cancer which has spread to my lung I thought that I would have a tough time, however the Trek surpassed my expectations and we had a fabulous time. It was honestly amazing and everyday brought a fresh challenges, lots of excitement and many laughs. We saw every imaginable primate and we walked along trails next to orang-utans and groups of Thomas Leaf Monkeys, many times within feet of them who were as interested in us as we were of them, at one time they brought their babies to see us, it was humbling experience. Our Local Guides were brilliant and after the trek we were invited to a local wedding. Our Charity Challenge Guide Penny was superb and to be honest she made it for us, though Jo and Claire the other leader and our very own Doctor made us feel safe and the whole teams knowledge was unsurpassable. To experience a place where few humans venture with breathtaking scenery and to bathe under mountain waterfalls is a gift and one I hope to do again. Great friends and life long memories were made and it was truly a wonderful life experience not to be missed. I will be joining Penny in a couple of weeks 🙂 I can’t wait, you all make it sound amazing.